These Grilled Salmon Burgers have been sponsored by Philips Kitchen Appliances. As always, all thoughts and opinions are my own. Fresh and flavorful, these Grilled Salmon Burgers are a fun and healthy 30-minute recipe made with juicy grilled salmon, microgreens, and creamy Garlic Lemon Aioli. Enjoy these easy Salmon Burgers at your next game day celebration, summer BBQ, or weeknight dinner. 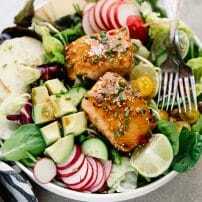 If you love salmon and fun, bite-size foods then you are going to love these easy, healthy, and flavorful Grilled Salmon Burgers with Garlic Lemon Aioli. Perfect for game days, rainy days, sad days, or Sundays, these juicy and delicious 30-minute Salmon Burgers are always a good idea. I love all burgers, but these grilled salmon burgers are probably my favorite. 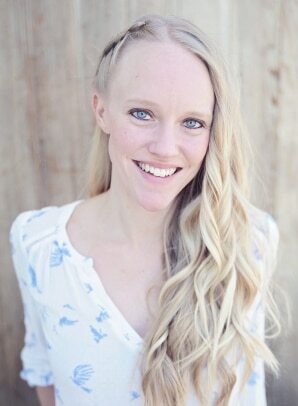 Why do these beauties top the list? They’re the easiest thing in the whole wide world. Unlike beef or turkey burgers, there’s no mixing or shaping or fear of them falling apart. Less mess and fewer dishes to get them prepared. They’re something different. 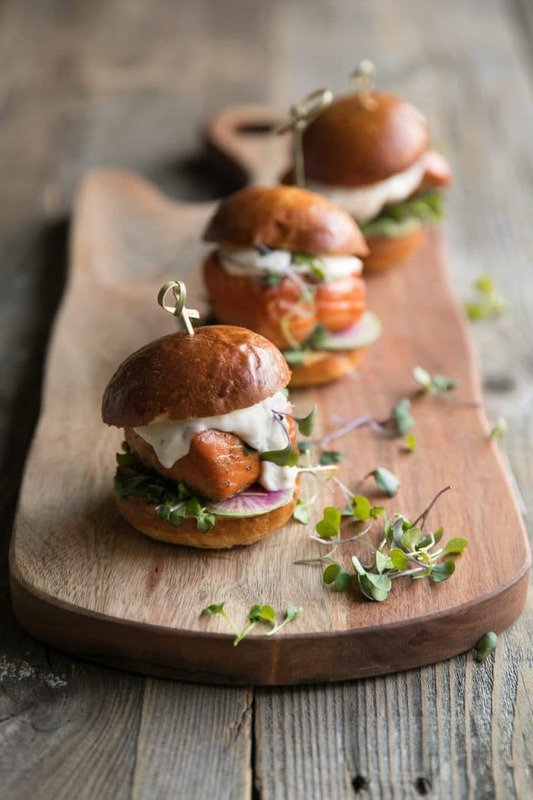 We’ve all been to a party with hot dogs and cheeseburgers, but salmon sliders? Have you? Not me. Salmon rocks my socks off. 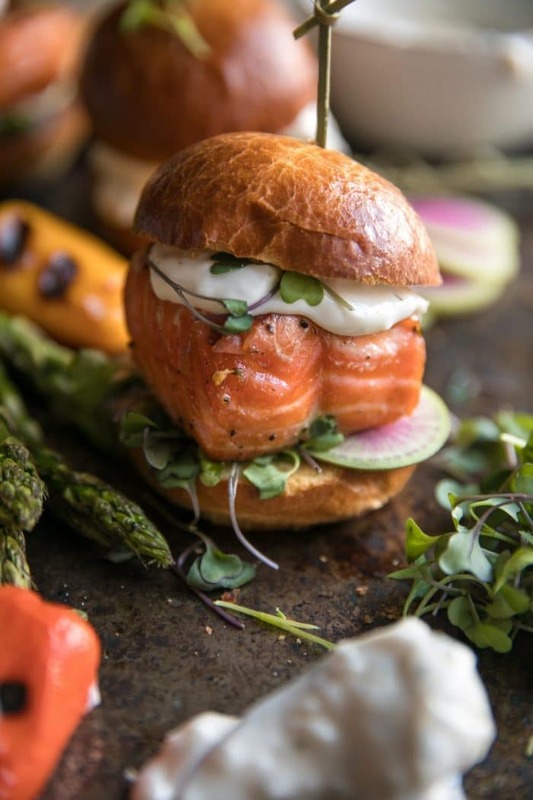 To keep this recipe super simple slice your salmon fillets into approximately 2×2-inch pieces so that they fit perfectly between my favorite pretzel slider buns. So much easier than mixing raw salmon burger patties, and just as fast! Unlike these Sesame Crusted Salmon Burgers, this recipe is made using entire salmon fillets. I love this for so many reasons, but mostly because it keeps things super simple. For the juiciest, most flavorful salmon burgers you’ll also need to marinate them for at least 30 minutes. Prepare the marinade. Add all ingredients for the marinade to a large bowl. Whisk to combine. Transfer marinade to a large ziplock bag and carefully transfer salmon chunks to the bag with the marinade. Allow salmon to marinate for at least 30 minutes or up to 4 hours. Prepare any toppings (such as the Lemon Garlic Aioli). Unless you plan to marinate your salmon for several hours, now is a good time to get everything else ready to go. 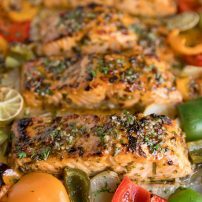 This also includes any sides you may want to include or vegetables you may want to grill with the salmon. Grill the salmon. Preheat grill to medium and lightly brush grill grates with oil. 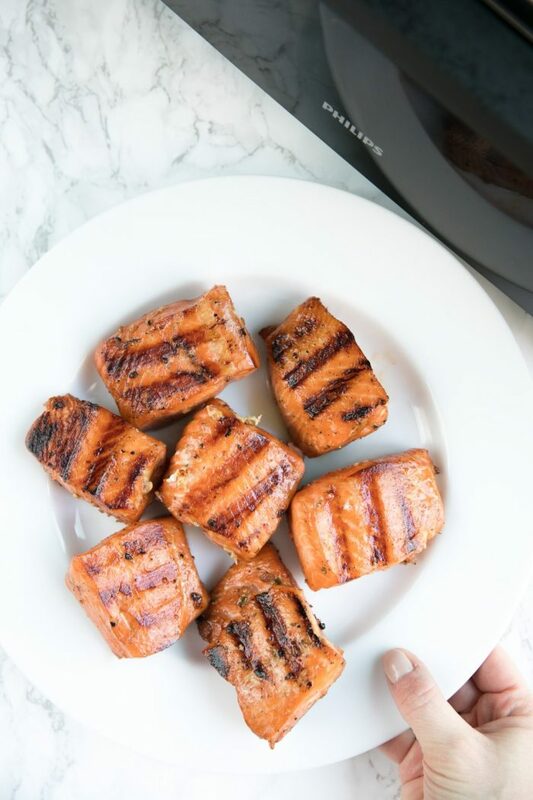 Carefully transfer salmon to preheated grill, discarding any leftover marinade. Cook the salmon for approximately 5-8 minutes per side (time will vary depending on the thickness of your fish). Assemble and serve! 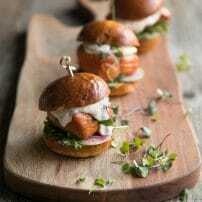 I kept the toppings for these grilled salmon sliders minimal, but feel free to add all your favorites! The Philips Smokeless Grill. You guys, have you seen it? It’s basically a grill for indoors. It’s amazing and I love it. I am a person who hates going outside, uncovering the grill (black widows), getting it ready, and then cooking food while trying to keep an eye on my child who is most definitely up to no good. It’s a hassle and a huge pain. And, on the occasions that my husband grills, he will disappear outdoors for 45 minutes. Don’t get me wrong…there is a time and a place for outdoor grilling. BUT, there is also a time and a place for indoor grilling. For example, game day. When you’d rather be hangin’ inside with your friends rather than outside with your grill. Or, in the middle of a snowstorm. And, for anyone out there without space or permit for an outdoor grill. I’ve been there and it’s the pits. So what makes the Philips Smokeless Grill so great? 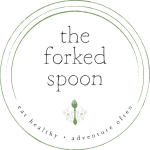 Delivers perfectly grilled food every time with an authentic grilled taste – seared perfectly on the outside, and juicy on the inside. Virtually no smoke (80% less). This is possible due to unique infrared cooking technology which prevents hot fat from burning. It’s easy-to-use and easy-to-clean because the drip tray is always cool for minimal splattering. All parts are removable and dishwasher-safe. BUT WAIT! 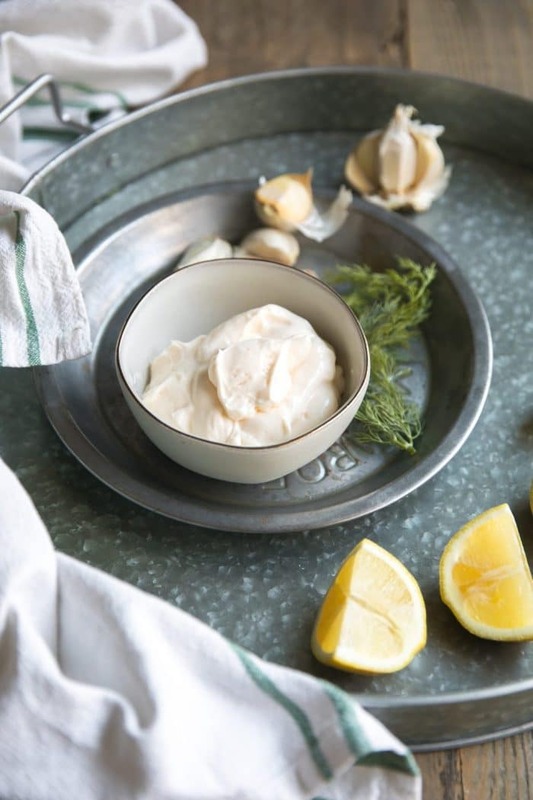 We can’t forget about the Lemon Garlic Aioli (aka mayo mixed with garlic and lemon juice and a couple other things). 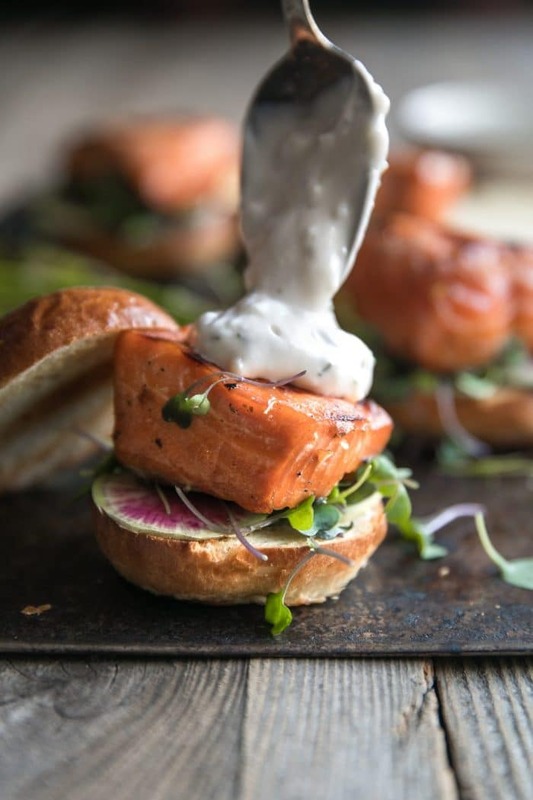 While this fun and easy little addition isn’t a requirement, I can’t think of a good reason why anyone wouldn’t want to top their grilled salmon sliders with a dollop of this magic sauce. Just kidding. Maybe food allergies or something like that. But, I can’t think of any other reason. These delicious salmon burgers want to be served with everything! If you try making these Grilled Salmon Burgers, please leave me a comment and let me know! I always love to read your thoughts and feedback! 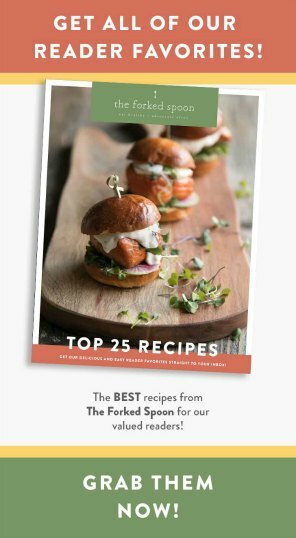 DON’T FORGET TO PIN AND SHARE THIS EASY AND DELICIOUS SALMON BURGER RECIPE TO ENJOY AND SERVE FOR ALL YOUR FRIENDS AND FAMILY AT YOUR NEXT PARTY OR CELEBRATION! Get ready for Game Day with this fast, fresh and easy 30-minute recipe for perfectly petit Grilled Salmon Burgers with Garlic Lemon Aioli. In a medium bowl add all ingredients for the Lemon Garlic Aioli and stir well to combine. Season with additional lemon juice and salt, to taste. Set aside in the refrigerator to allow the flavors to set. Add all ingredients for the marinade to a large bowl. Whisk to combine. Transfer marinade to a large ziplock bag and carefully transfer salmon chunks to the bag with the marinade. Allow salmon to marinate for at least 30 minutes or up to 4 hours. Outdoor grill- Preheat grill to medium and lightly brush grill grates with oil. Carefully transfer salmon to preheated grill, discarding any leftover marinade. Cook the salmon for approximately 5-8 minutes per side (time will vary depending on the thickness of your fish). Set your Philips Smokeless Grill to "grill" and preheat. Carefully brush the grates with a light coat of canola oil and transfer the salmon chunks to the grill, skin-side-down. Discard marinade. Allow salmon to cook for approximately 5-7 minutes on each side, or until salmon starts releasing white, creamy-looking beads on its surface (this means it's done). Remove salmon from the grill and transfer to a clean plate to rest. 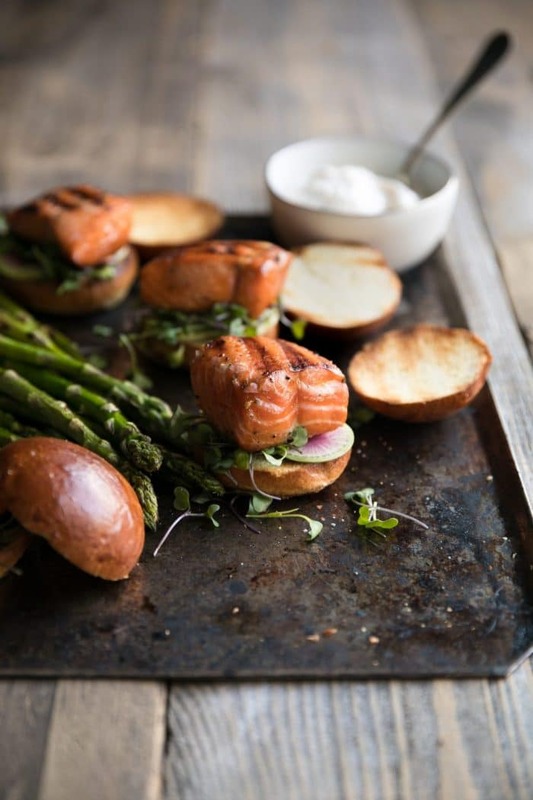 As the salmon rests, transfer the sliced slider buns to the grill and toast for 2-3 minutes, taking care not to burn. Turn off heat. 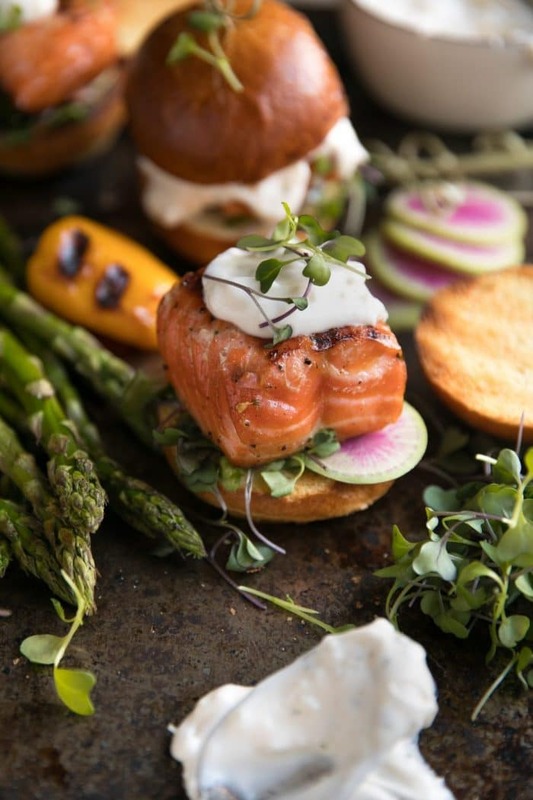 Remove buns and top with a thick layer of micro greens, cooked salmon, watermelon radish, and lemon garlic aioli. Delicious served immediately, or leftover. OPTIONAL- the Philips Smokeless Grill is amazing for grilling vegetables such as asparagus, mini sweet peppers, corn, zucchini, etc. To grill, brush with a thin layer of vegetable oil and a sprinkle of salt and pepper. Grill each side for 3-4 minutes, or until cooked (cooking times will vary depending on the type of vegetable). I asked my local supermarket butcher to cut my salmon into slider-size pieces. If this is not available to you, pieces a little less than 2x2 inches is perfect. These little sliders look delicious! I’m excited to give this a try now, it looks like so much flavor haha great recipe, thank you! What refined sliders!! These sound absolutely delicious, and they’re adorable (this matters). Thanks for sharing this creative and flavorful idea!